Scooper - Technology News: After Macron's victory, what next for France and Europe? Macron’s decisive victory in this pivotal election for France and the European Union showed that the so-called French “Republican front” still holds. Millions of voters from the centre-left and centre-right, who supported other candidates in the first round of presidential voting two weeks ago, rallied around Macron in the run-off, preventing the extreme right from gaining power in France for the first time since the 1940s . The election caps Macron’s meteoric and improbable rise in French politics. He was still relatively unknown when President François Hollande selected him to serve as economy minister three years ago . And when he announced his bid for the presidency last year, few experts gave him much of a chance . 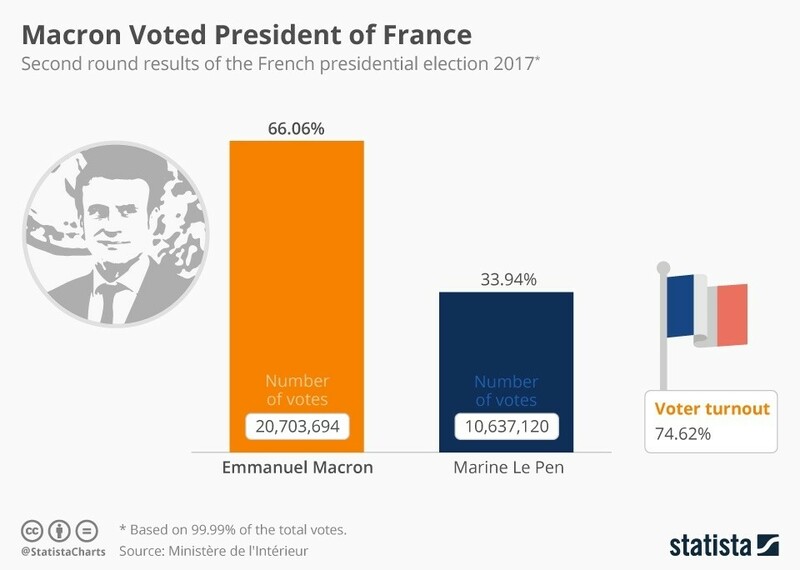 Though Macron has an impressive pedigree , he has never held elective office. And he ran as a self-proclaimed outsider, unaffiliated with any of France’s mainstream parties. According to a statement released by the campaign , the hack was “an attempt to destabilise the French presidential election” by sowing doubt and misinformation. There is no firm evidence yet, but French officials suspect that the hackers have ties to Russian intelligence , and are the same group that was behind last year’s attack on the Democratic National Committee’s computer systems in the United States. He must now also deliver on his reform agenda . But whether he will be able to do so depends on the outcome of the elections to the National Assembly, France’s lower and more powerful legislative chamber , which will take place in June. Because Macron launched his En Marche! movement just a year ago, the party currently holds no legislative seats . It is running candidates across the country, but many of them are young and inexperienced, and it remains unlikely that the party will capture the 289 seats needed for a parliamentary majority. In France, the prime minister as head of government must reflect a parliamentary majority, meaning that she or he may come from a different party than the president. The French call this “cohabitation” and it has happened only three times since 1958 . Such a scenario would make it harder for Macron to propose and implement his reforms. President Hollande had a majority in parliament, but even so was unable to push through his agenda, and his approval rating sunk to record lows . For now, polls are placing Macron’s movement as the frontrunner in June’s legislative elections. En Marche! is forecast to capture between 249 and 286 seats , centrist and conservative parties are projected to win between 200 and 212 seats, the Socialists 28 to 43 and Le Pen’s National Front 15 to 25. If Macron is unable to deliver on his political agenda — in particular, giving a boost to France’s anaemic economic growth and bringing down unemployment – voters may turn to candidates of the extreme right or the extreme left in the next presidential election. After all, in the first round of this year’s election, such candidates captured nearly 50% of the vote. Macron’s mandate is uncertain. Many people voted for him in the second round not out of conviction but to ensure Le Pen’s defeat. Despite her attempts to “ un-demonise ” the National Front, many French people still see it as xenophobic and a threat to democracy.